In a previous post we shared the best easy-to-maintain indoor house plants and their benefits. It looks like 2019 will continue the popularity of bringing the outdoors in, biophilia -the relationship between humankind and nature, provides such a great compliment to woods and natural color palettes. Warm colors and soft pinks are in and quickly gaining popularity, if you’ve been waiting to carryout dashes of pink and warm neutrals in your home, this is your year. Homeowners, especially in the coastal areas, are bringing back the light-colored floors. The lighter colored floors give a brighter and more airy feel to the home, perfect for a beach setting. Love the neutral tones of your kitchen but want to add a bold statement? Make your space pop with a patterned backsplash. 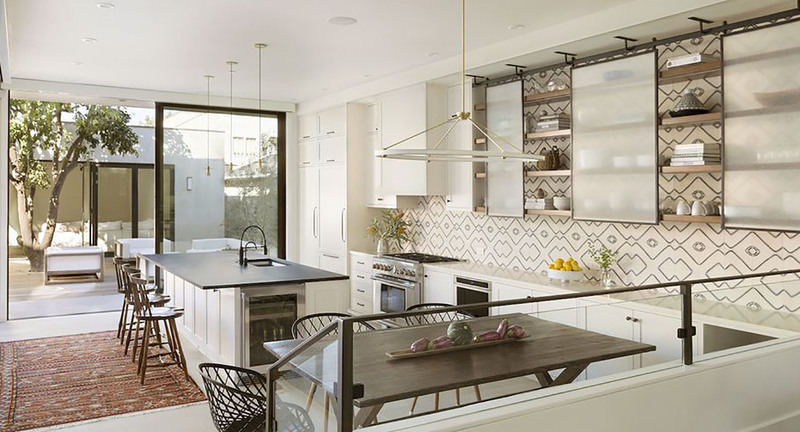 If you’re not ready for a full backsplash revamp, you can always create a more subtle pop by utilizing the patterned backsplash in a small area above your range. We talked about mixing metals and the chic look it can give a home in our Fall 2018 Design Trends post and it looks like it’s here to stay! Give your home a timeless feel by adding mixed metals to your environment. Design is ever-changing and keeps us feeling inspired. New trends and décor let us express ourselves through our home and create an inviting space for family and friends to gather. Let your inner interior decorator come out and add some fresh new design to your home this year. Let us know what you see coming in, staying or fading in 2019.